High-growth startups are widely considered to be key drivers of growth in aggregate employment, productivity, and output (Decker et el. 2016a). Not surprisingly, policymakers are keen to create an institutional climate in which high-growth startups, or ‘gazelles’, can thrive. However, in order to design effective policies, we must first understand what sets gazelles apart from other startups. One way of thinking about high-growth startups is that such firms are simply born with high-growth potential. For example, a startup might be founded based on a particularly scalable business proposition or bring a novel and lucrative technology to market. Another possibility is that sometime after the business opens, it expands in response to a sudden surge in profitability, perhaps due to unexpectedly high demand or a cost-saving process innovation. We refer to these two possible drivers of growth as ex anteand ex post, respectively. While both mechanisms are likely at play, their relative importance in determining firm growth will shape the design of effective policies for fostering high-growth startups. For instance, if unpredictable changes in business conditions are the main source of differences in firm growth, then policies aiming to foster new entry of high-potential firms may be fruitless. What makes a high-growth startup? Existing research points to an important role of pre-startup decisions for the subsequent growth of firms. For instance, firm growth is partly predictable based on characteristics observed at founding, such as the business name, location, and legal structure (Belenzon et al. 2017, Guzman and Stern 2016). Similarly, survey evidence indicates that the expectations of nascent entrepreneurs have important implications for the future growth potential of their firms (Campbell and De Nardi 2009, Hurst and Pugsley 2011). Finally, Sedlacek and Sterk (2017) show that aggregate business cycle conditions at entry have long-lasting effects on the growth potential of startups. While prior research suggests that firms are born different, it has not quantified the importance of these ex ante differences for firm growth and ultimately for macroeconomic outcomes. In recent research, we tackle these questions by combining detailed administrative data covering the population of US employers since the late 1970s with a macroeconomic model of firm dynamics (Pugsley et al. 2018). Our approach allows for both differences in growth potential at birth (ex ante) and unexpected success over the life-cycle (ex post) and estimates the relative importance of these sources from the data. Our approach is based on the insight that the empirical autocorrelation of a firm’s employment across many years can be used to disentangle the importance of ex-ante and ex-post factors in driving differences in firm growth. To understand this, imagine that firms were different only because of ex ante factors determined at startup. In this case, the autocorrelation of size over firms’ life-cycles would be high, since gazelles would not only grow large but also start up large. In contrast, if businesses were different only because of ex post shocks affecting them over time, then long-run autocorrelations would be low. This insight has a long tradition in a vast literature on household earnings dynamics (e.g. Abowd and Card 1989, Guvenen 2009), which differentiates permanent income heterogeneity from transitory income shocks. It had yet to be applied to firms, where reliable and lengthy panel data on firms have only recently become available. We document the autocovariance structure of firm size estimated for millions of US firms over horizons up to 20 years. In conjunction with our macroeconomic model, we use this structure to quantify the importance of ex ante and ex post factors underlying their growth. We find that the ex ante growth potential is a key determinant of firm performance, as opposed to ex post shocks. In particular, differences in growth potential account for 65% to 90% of the dispersion in firm size among young firms. Interestingly, however, this contribution remains high even for old firms. For instance, about half of the differences in size across 20-year old firms can be explained by factors that were present already at their startup. We also find that ex ante differences are an important driver not just of size, but also of firm survival and selection. Taken together, these findings support the idea that many of the makings of gazelles are already in place before the business even opens its doors. Having estimated that ex ante factors are a key driver for firm-level outcomes, we use the model to quantify the impact of high-potential startups on the macroeconomy. The term ‘gazelle’ has typically been defined to encompass all firms with fast realized employment growth (Birch and Medoff 1994). We instead define gazelles as startups which are expectedto at least double in size within the first five years and to have more than ten employees at some point during this period. That is, we classify startups by their ex ante growth potential rather than the ex post realised growth. We estimate that gazelles make up only about 5% of the startup population. However, despite their modest share among new firms, gazelles are key drivers of aggregate job creation and output. For instance, in our estimated model, an average firm grows from four to roughly eighteen employees by age 20. Without gazelles, this average growth profile would be much flatter, rising from four to only fourteen employees, i.e. 25% less. Gazelles disproportionately contribute to aggregate employment not just because they grow faster, but also because they survive longer. By age five, gazelles account for about 35% of aggregate employment within their age group. The disproportionate growth contributions of gazelles to aggregate employment extends to aggregate output and productivity. Overall, these results indicate that the birth of high-potential startups is key to macroeconomic performance. Decker et al. (2016 a,b) have recently documented a slowdown in ‘business dynamism’, notably characterised by a decline in the skewness of firm growth rates. This suggests that high-growth firms are becoming less prevalent, which seems concerning in the light of the recent slowdown in aggregate productivity growth. However, what is unclear is whether this pattern is driven by changes to the growth potential of new businesses, or whether it has been driven by changes in the shocks to profitability after the business starts. We use our model to investigate directly whether the prevalence of our ex ante gazelles in the population of startups has declined over time and quantify the macroeconomic effects of such a decline. Looking only at realised growth, high growth firms are indeed a shrinking share of new entrants. This disappearance set in already during the late 1980s. 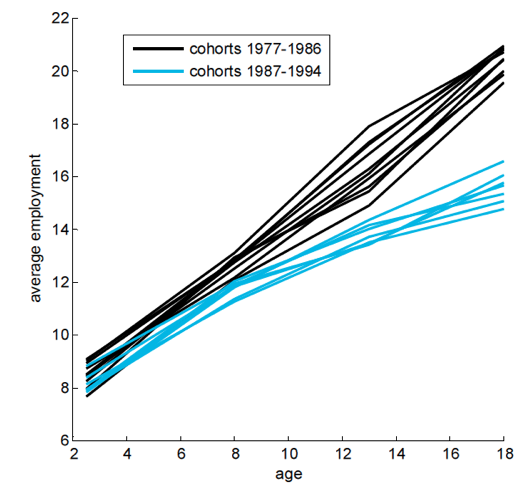 Figure 1 shows average employment in cohorts born between 1977 and 1994. Average employment growth in the cohorts born since 1987 is substantially lower than in the earlier cohorts. Source: Pugsley et al. (2018). Importantly, our estimated model attributes this downwards shift largely to a decline in the number and also the growth potential of ex ante gazelles. Their fraction in the startup population declined by about a fifth. Moreover, we find that on average, gazelles grow less than they used to, which further contributed to the decline in average size growth. In our model, this thinning out of gazelles has substantial macroeconomic effects, lowering aggregate output by 4.5%. A large body of research in macroeconomics aims to understand how various policies affect the behaviour of existing firms. Our findings show that much of the performance of a firm is driven by factors that are determined at or just before the time of startup. Therefore, it is important to understand how policies affect which types of people aspire to become entrepreneurs, how they develop potential business models, and which business ideas they ultimately decide to pursue. This is a challenging objective, since it is relatively difficult to observe entrepreneurial decisions if no firm has been set up yet. However, our research indicates that precisely these pre-entry decisions are paramount to macroeconomic performance. Abowd, J and D Card (1989), “On the Covariance Structure of Earnings and Hours Changes”, Econometrica 57(2): 411-445. Belenzon, S, A K Chatterji and B Daley (2017), “Eponymous Entrepreneurs”, American Economic Review 107(6): 1638-1655. Birch, D and J Medoff (1994), “Gazelles”, in L C Solmon and A R Levenson (eds), Labor, Employment Policy, and Job Creation, Westview Press, p. 159-68. Cambell, J R and M De Nardi (2009), “A Conversation with 590 Nascent Entrepreneurs”, Annals of Finance 5(3-4): 313-340. Decker, R A, J Haltiwanger, R S Jarmin and J Miranda (2016a). “Where Has All the Skewness Gone? The Decline in High-Growth (Young) Firms in the US”, European Economic Review 86: 4-23. Decker, R A, J Haltiwanger, R S Jarmin and J Miranda (2016b). “Declining Dynamism, What We Know and the Way Forward”, American Economic Review 106(5): 203-207. Guvenen, F (2009), “An Empirical Investigation of Labor Income Processes”, Review of Economic Dynamics 12(1): 58-79. Guzman, J and S Stern (2016), “The State of American Entrepreneurship: New Estimates of the Quantity and Quality of Entrepreneurship for 15 US States, 1988-2014”, NBER Working Paper 22095. Hurst, E and B Pugsley (2011), “What do Small Businesses Do?”, Brookings Papers on Economic Activity, Fall. Pugsley, B, P Sedlacek and V Sterk (2018), “The Nature of Firm Growth ”, CEPR Discussion Paper 12670. Sedlacek, P and V Sterk (2017), “The Growth Potential of Startups over the Business Cycle”, American Economic Review 107(10): 3182-3210.